Our focused strategy for Paints and Coatings is designed to accelerate growth and profitability. This means becoming the number one choice for customers. By returning to our paints and coatings roots – established more than two centuries ago – we are adopting a laser sharp focus to achieve 15% return on sales* by 2020. 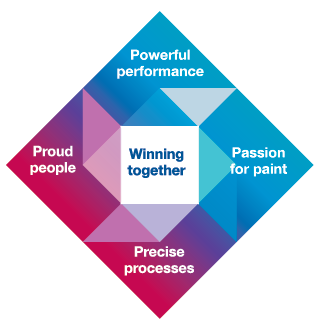 Success will be found in streamlining our core capabilities – making and selling paint – and striving for the best efficiency and performance in what we do. We aim to set the standard, be first choice for customers and shape the industry. To help us achieve our ambitions, we have launched a “Winning together” transformation program which will make the most of the focus we now have in our company. While operating in a changing environment, we will be consistent in our values and principles. We will focus on building trust and enhance our engagement across all levels in the company.